I smile a lot. No. I mean, really. A lot. But, even without wine, I'm generally a pretty smiley chick. You have to be to keep the doldrums at bay, and to get through whatever it is you have to get through. 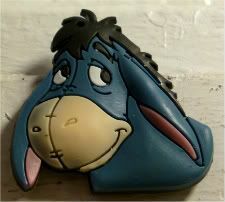 I mean, look at Eeyore here. It's why I picked him up at that street fair last week, cuz he's one of my faves. He knows. Sad about the world, but somehow he's still got a sad little smile on his face. Some of my old colleagues used to get superticked off at me because even when I'd be delivering bad news, somehow I'd still be smiling. I can be pissed off as hell and still be smiling. In fact, that's how you know there's trouble, when I can't muster up a smile for you. When that happens, just shut up, back away slowly and don't make any sudden moves. And give me some space. Sooner or later, I'll be smiling again. Maybe not at you, but surely, at something. "The nicest person you've ever met..."
A toy surprise in every meal!